Fifteen years ago this month I started peoplezest. 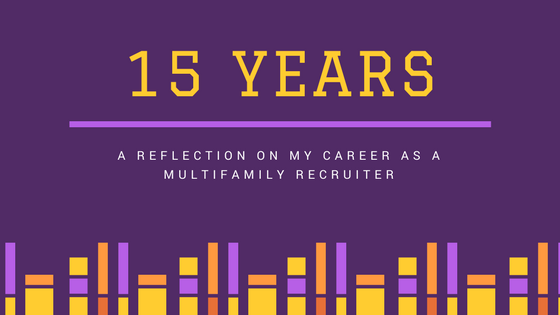 With my passion for people and team building paired with my background in hands-on property management, I set out to make the connections that make multifamily teams succeed. Over all of these years I have loved meeting the incredibly hardworking and creative people at properties across the country, but I have also learned a few lessons! 1) For fifteen years when I have asked candidates what would motivate them to move from their current job to a new role. Over and over I have heard the answer, "A more balanced life." 2) The multifamily industry is sophisticated and on a fast train of progress! 3) Technology has drastically changed relationships. 4) Real Estate cycles are REAL. 5) Work environment, culture, and people remain a top priority for candidates. 6) I still love front line recruiting! 7) Hiring managers need to continually treat candidates with more respect. 8) There are some people in multifamily with huge hearts. successful in student housing. It is an art. 10) Thank you notes are still important. 11) People - residents, employees, vendors, bosses, peers - all want to feel appreciated. 12) People work for people they like, not just companies they like. 13) Companies are ALWAYS looking for great people. 14) When you get out of the business for a while, you can't expect to jump in where you left off. Property management is always changing! 15) Even after fifteen years of business, I still wake up some mornings feeling like it is my first day. After 15 years, this work is still meaningful and I appreciate the role each of you has played - client, candidate, consultant, friend. Thank you for joining me on this journey!